I’m sure most of us have heard, at least at one point when we were growing up, that when we’re angry and about to fly off the handle, that we should calm down before we act rashly. One common way to cool off when we’re emotionally heated is to count to ten: take a deep breath, count from 1 to 2 to 3 all the way up to 10, then breathe deeply again, and by that point we should have calmed down enough to act at least a little more rationally and reasonably instead of like the geomantic figure Puer on caffeine. Turns out that this little counting trick is good for other things, too, and I’ve adopted it as a basis for a short but powerful mathetic meditation exercise. We’ve already described at least one method of mathetic meditation before by meditating on the letters by means of sound and by means of symbol, and we’ve alluded to meditating on the structure of the Tetractys, but now I’d like to make that latter part more specific. Exhale completely, breathing out from your center. This is the preliminary emptying breath; it might help to make a soft popping noise with the mouth (“peh peh peh peh peh”) to completely empty the lungs. Inhale into the center deeply, filling your lungs from the bottom up. Count to four at a slow and natural rhythm. Hold the breath without closing the throat. Count to four. Exhale completely, emptying your lungs from the top down from your center. Count to four. Hold the lungs empty without closing the throat. Count to four. Repeat from #1 as necessary. This is the basis of the fourfold breath that other authors, such as John Michael Greer and Jason Miller, have used in their meditative and contemplative work, and I’ve used it before in my meditations on the geomantic figures as well as for devotional meditations using the Trisagion prayer. It’s a great way to start off any meditation session, and a great meditative tool in its own right which can lead to deep insights, if not complete enlightenment a la the vipassana tradition in Buddhism. Before proceeding with the actual mathetic meditation below, give this a try for a few sessions lasting at least five minutes each. Bless us, divine Number, you who enform gods and men! O holy, holy Tetractys, you who contain the root and the source of all eternal and eternally flowing creation! For the divine Number begins with the profound, pure Monad until it comes to the holy Tetrad, then it begets the mother of all, the all-comprising, all-bounding, first-born, never-swerving, never-tiring, holy Decad, the keyholder of all! On the first breath, intone the number “One” in your native language, breathing out from your center (or vibrate it, if you’re into that). Visualize a single point in your mind and hold the image. On the second breath, intone the number “Two”, breathing out as above. Visualize a second point beneath and to the left of the first with a single path linking the two. Hold the image. On the third breath, intone the number “Three”, breathing out as above. Visualize a third point to the right of the second, with two new paths linking this third point to the prior two. Hold the image. On the fourth breath, intone the number “Four”, breathing out as above. Visualize a fourth point beneath and to the left of the second, with two new paths linking this fourth point to the second and third points. Hold the image. On the fifth breath, intone the number “Five”, breathing out as above. Visualize a fifth point to the right of the fourth, with two new paths linking this fifth point to the fourth, second, and third points. Hold the image. On the sixth breath, intone the number “Six”, breathing out as above. Visualize a sixth point to the right of the fifth, with three new paths linking this sixth point to the fifth, second, and third. Hold the image. On the seventh breath, intone the number “Seven”, breathing out as above. Visualize a seventh point beneath and to the left of the fourth, with one new path linking this seventh point to the fifth point. Hold the image. On the eighth breath, intone the number “Eight”, breathing out as above. Visualize a eighth point to the right of the seventh, with five new paths linking this third point to the seventh, fourth, second, fifth, and sixth points. Hold the image. On the ninth breath, intone the number “Nine”, breathing out as above. Visualize a ninth point to the right of the eighth, with five new paths linking this third point to the eighth, fourth, fifth, third, and sixth points. Hold the image. On the tenth breath, intone the number “Ten”, breathing out as above. Visualize a tenth point to the right of the ninth, with two new paths linking this third point to the ninth and sixth points. Hold the image. In your mind, you’ll’ve constructed the structure of the Tetractys of Life, all ten sphairai with all 24 paths between them. After the ten constructing breaths, perform another ten fourfold breaths intoning nothing, just holding the image of the Tetractys in your mind, letting yourself become absorbed in its structure. Once the tenth breath is complete, perform one last fourfold breath. On this last breath, let the image dissolve into your breath on the inhale, disseminating throughout your body on the exhale, and exhaling a clean, pure breath at the end. The meditation is complete. I like the idea of using one’s own native language to count; it’s a linguistic curiosity that thinking of numbers and using them in speech takes place in a different part of the brain than other types of prose or poesy, and it’s a mark of innate fluency when you can instinctively count in a different language other than your native one. In using your native language’s words for the numbers, the meditation becomes a little easier on the mind and makes the whole experience more natural and intuitive. However, if you want to be a little more mystical, you could also use “Monad”, “Dyad”, “Triad”, “Tetrad”, and so on up to “Decad”, so it’s up to you. I prefer the use of the simple native counting numbers, personally. On the first breath, intone the number “One”, breathing out from your center. Visualize a single point in your mind and hold the image. On the second breath, intone nothing. Hold the image. On the third breath, intone the number “Two”, breathing out as above. Visualize a second point beneath and to the right of the first with a single path linking the two. Hold the image. On the fourth breath, intone the number “Three”, breathing out as above. Visualize a third point to the right of the second with a single path linking this to the second point. Hold the image. On the fifth breath, intone the number “Four”, breathing out as above. Visualize a fourth point to the right of the first with three paths connecting this to the first, second, and third points. Hold the image. On the sixth breath, intone nothing. Hold the image. On the seventh breath, intone the number “Five”, breathing out as above. Visualize a fifth point to the left of the first with two paths connecting this to the first and second points. Hold the image. On the eighth breath, intone the number “Six”, breathing out as above. Visualize a sixth point beneath and to the left of the fifth with a single path connecting this to the fifth. Hold the image. On the ninth breath, intone the number “Seven”, breathing out as above. 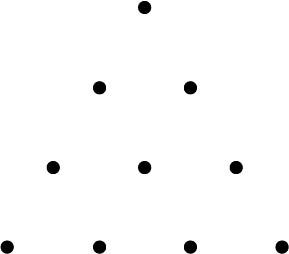 Visualize a seventh point between the sixth and second points with five paths connecting this to the sixth, fifth, first, fourth, and second points. Hold the image. On the tenth breath, intone nothing. Hold the image. On the eleventh breath, intone the number “Eight”, breathing out as above. Visualize a eighth point above and to the right of the first with four paths connecting this to the fifth, first, second, and fourth points. Hold the image. On the twelfth breath, intone the number “Nine”, breathing out as above. Visualize a ninth point above and to the left of the eighth with a single path connecting this to the eighth point. Hold the image. On the thirteenth breath, intone the number “Ten”, breathing out as above. Visualize a tenth point to the left of the eighth point with six paths connecting this to the ninth, eighth, fourth, fifth, seventh, and fifth points. Hold the image. On the fourteenth breath, intone nothing. Hold the image. Although we have ten points to construct as before, there are twelve stages total in the Gnosis Schema, where we cross over the central sphaira of Mercury multiple times. Once we complete a system of three points on the Tetractys around the sphaira of Mercury, we return to the central sphaira and prepare ourselves for the next system. Thus, once we complete a system and return to the first central sphaira of Mercury, we spend an extra breath just focusing on what we’ve constructed so far. After this, we do another ten fourfold breaths to hold the whole completed Tetractys of Life in mind, dissolving the image on a final, eleventh breath. I think this meditation exercise, the latter Gnostic Schema form of which I used during the ten days of my ritual of self-initiation, helps in developing an intuitive and innate understanding of the Tetractys, or at least plants a seed for the further growth of which as one develops in the study and practice of mathesis. With the Gnosis Schema variant of the meditation, it’s interesting to see how the paths develop along with the sphairai, which itself can help one with seeing how the Gnosis Schema develops a full understanding based on earlier foundations of practice as one traverses the Tetractys in this manner. It can help to use this meditation before any work in mathesis as a preliminary preparation, perhaps starting not with the sphaira of Mercury but the sphaira one is currently “at”, such as if one has progressed to the sphaira of Salt, one begins with constructing the Tetractys there and proceeding to the “second” sphaira of Earth, then the “third” sphaira of Water, and so forth, again pausing whenever one reaches the sphaira of Mercury. One can further enhance this meditation by adding on the letters, numbers, and stoicheia of the paths into the meditation, perhaps spending another breath per each path that develops as one constructs a new sphaira in the visualization. The living (beings) in heaven are constituted of fire and air, and those (which are) on earth of the four elements. Man (is) a reasonable living (being), for he has Nous; but all of the other living (beings) which are endowed with voice have breath and soul, since all that decreases and increases is a living being. At this point in the Definitions, we know that there are multiple parts of the world, from the meta-world of God to the pale blue dot of Earth where Man resides, at least for a part of it. All things within God are intelligible, indicating that they can be known. Within the meta-world of God, we know that there’s a place referred to as heaven, within which there are the four elements which constitute all of the bodies. Things with bodies are not only intelligible, but they are sensible, which is a necessary quality of existing within heaven. However, all things both intelligible and sensible and non-sensibile are all part of the One, the All, the Whole that is God; everything is interconnected, even if some parts of the worlds are outside and seemingly unconnected to other parts of the worlds. Although the definitions have mentioned living beings before, now we finally get to what those beings are composed of and what they’re all about. First, just as we know that there’s a distinction between heaven and earth (II.2), we also know that there are “superior beings” and “inferior beings” (III.3), or entities that are of heaven but not of Earth and entities that are of Earth within heaven, respectively. According to this definition, the superior beings or “living beings in heaven” are made of “fire and air”, while the inferior beings “which are on earth” are made of the “four elements”. So, while superior beings are made of fire and air, inferior beings are made from fire, air, water, and earth. This makes sense: we know that air is the glue that binds the earth and heaven together but is of neither heaven nor earth (II.2), and we know that fire is sterile and the “perpetuation of immortal beings” (II.5). Earth and water, however, support each other (II.3, II.4) but are much denser than air or fire. Knowing that the superior beings are made of only air and fire, we also know that they cannot die nor can they reproduce by growing; these are qualities that fire prohibits. Fiery beings without earth must be immortal, since earth exists to be changed as well as to hold both life and death, while fire is the life itself of immortal beings. In addition, without earth to be changed, heavenly beings inherently are incapable of change, since there’s nothing to change within their bodies; this is not the same thing as increase and decrease, however, which fire and air both permit them to do. Air, however, allows the heavenly beings to move around both in the heavens and between heaven and earth. By including water and earth into fire and air, we obtain inferior beings, who have the capacity to be born, grow, increase, decrease, and die. However, inferior beings also have air and fire, which give them some of the qualities of the superior beings, but not all of them; indeed, the fire itself within an inferior being may be the seed of its downfall and death, since fire is the “destruction of the mortal [bodies]”; fire will, over time without proper maintenance, burn out the rest of the body and kill it. However, even though heavenly bodies can travel between the upper heavens and lower earth, the same is not true of earthly bodies. This is due to the earth within the bodies themselves; we know that, from the Poemander, earth and water were left behind when the Nous separated the elements. Fire rose up first and highest, and air followed the fire underneath it, but water and earth remained below, being heavy and dense. Due to this, without removing all the earth and water from an earthly body, it will be too dense to rise higher than the earth itself from which it was made and grown. Of all the living beings, there also exists Man, the reasonable, sensible, and destructible world (I.1). Man is reasonable because “he has Nous”, meaning that Man has Mind. More importantly, the definition doesn’t say that Man has “a mind”, but that he has “Nous”, being God. Thus, Man possesses or carries with him “the invisible good” of Mind with him, allowing him to reason as Nous or God itself reasons. However, “all of the other living beings which are endowed with voice have breath and soul”. This shouldn’t be taken to mean that Man only has Nous and no soul nor breath, since we know that all bodies must possess a soul of some kind (I.3), and that Man has both soul and breath (I.4), and now that Man has soul, breath, and Nous. Other living beings, though, have only soul and breath, though they have “voice”, which is something we can expect that Man also has, but what this function is relative to the other attributions is as yet unknown. After all, without Nous, something can still be a living being if it has soul and breath and is composed of at least some of the elements, since “all that decreases and increases is a living being”, and all things down here under heaven perform that function by means of the interactions of the elements. Tat. Tell me, O father: This Body which is made up of the Powers, is it at any time dissolved? Her. Hush, [son]! Speak not of things impossible, else wilt thou sin and thy Mind’s eye be quenched. The natural body which our sense perceives is far removed from this essential birth. The first must be dissolved, the last can never be; the first must die, the last death cannot touch. Dost thou not know thou hast been born a God, Son of the One, even as I myself? Because of our godly creator and who gave us a godly component, we too are not only part of God but we are, in a sense, many made in the image of God or the likeness of God. And it’s all because of our reasoning, mental, thinkable capability; it’s not due to our physical form, though that may also be true through a highly indirect path via the heavens, Earth, and elements. Thus, though we are a living being capable of death, we are unlike the other such mortal living beings because of Nous, which makes us, in a sense, immortal-but-not-in-the-normal-sense. Light is a good, a clear vision, (which makes) appear all of the visible (things). The essence of fire is burning. However, fire is one (thing) and light is another one. For what fire has reached shall be destroyed, but light appears just as it is by itself. Every move of soul is perceived by Nous; since it is some (kind of) energy, breath performs (it). Bearing in mind that we now know about the four elements that constitute “every kind of body”, this definition then goes on to describe the nature of the thing behind the body. If this is starting to make this sound like a fifth element or quintessence (literally, “the fifth essence”) like spirit or akasha of modern occultism, you’re catching on, but there’s some more unpacking to do first. First, let’s talk about light. Light is “a good”, not “the good” of the Nous, but it is “a good”. While this type of phrase hasn’t yet been encountered in the Definitions, we can assume that this means that light is a quality of the Nous, or that light is something from of and part of the Nous. In either way, light is something divine, something mental. Light is also “a clear vision, which makes appear all of the visible things”. When modern people think of light, they think of some sort of electromagnetic waves that bounce off and reflect from objects, and these waves are then registered by the eyes to produce neural signals to be interpreted as a vision. Classically, however, light was seen to emanate from the eyes or objects themselves and catch alight of other things (and is one of the reasons gazing magic and the “evil eye” are still around). Light is vision itself; more importatly, light is a clear vision, that which illumines and enlightens, that which presents things clearly and truly in its true form. However, light can only work to make things appear that are already visible, or able to be seen. Things that are bodiless or only intelligible without being sensible cannot be seen, and so light is independent of these things; light, then, is probably a component of the Nous in the cosmos, since being visible is a special kind of being sensible, and only the cosmos is the part of God that is sensible. Her. For It doth will to be, and It is both Itself and most of all by reason of Itself. Indeed all other things beside are just because of It; for the distinctive feature of the Good is “that it should be known.” Such is the Good, O Tat. Tat. Thou hast, O father, filled us so full of this so good and fairest Sight, that thereby my mind’s eye hath now become for me almost a thing to worship. For that the Vision of the Good doth not, like the sun’s beam, fire-like blaze on the eyes and make them close; nay, on the contrary, it shineth forth and maketh to increase the seeing of the eye, as far as e’er a man hath the capacity to hold the inflow of the radiance that the mind alone can see. Not only does it come more swiftly down to us, but it does us no harm, and is instinct with all immortal life. Thus, while bodies are sensible, light may be the actual function of sense itself, where anything sensed is done so by means of light, which illumines the mind. And since all bodies in the cosmos have a soul made just for it, since each body cannot exist without one, soul itself is what makes itself known by means of the body. After all, the soul is “a necessary movement adjusted to every kind of body”, though itself is invisible, much how the Nous is the “invisible good”. The soul is what enables a body to move and function in the cosmos, and since the body is sensible, the soul is evident through the body. Because of light, we can sense the motion of bodies and therefore of souls, either physically through our eyes or mentally through the sight of the mind, but in either case this perception is done with light. And, further, because the Nous perceives all things, especially through and because of the minds of Man, “every move of soul is perceived by Nous”, and this perception is made possible through light. The last part of this definition is a little complex, but it relates to the connection between soul and spirit. “Since [every move of soul] is some kind of energy, breath performs it.” In other words, the soul provides a force that is enacted through the body into the cosmos, but the relationship between the soul and the breath (or spirit, since these terms are interchangeable so far) has not yet really been fully explored. We know that Man exists as a microcosm due to “soul and breath” (I.4), and that breath is the “body of soul or the column of soul”. Because the body is moved by the soul, the body is moved by means of the breath because of the soul. The breath is what keeps the physical body able to receive the soul’s motions, so the breath is the facilitator of the soul into the physical body. In other words, breath performs the motions in the body that the soul desires to give it. We can think of the breath as something akin to air. Air is the element that binds the upper heavens with the lower earth. Similarly, the breath is something that combines the soul with the body. Just as the influences of the higher heavens can be felt down here by means of the air and the forces that travel through it, the influences of the soul can be felt and enacted by the body by means of the breath and the motions that pass through it. So much for the last definition of part II. From this set, we know there are four elements that constitute the body: earth that provides the material basis for action, water which nourishes and moistens, air which conjoins and permits influence between different locations, and fire which desiccates and destroys. All bodies are made out of some composition from these elements, and all bodies are given motion and movement from the soul. The soul, which is necessary but not sufficient to animate the body, is given expression through the breath or spirit, which like the air that conjoins the upper heavens and lower Earth conjoins the soul and body together. All bodies, being sensible, are known by means of light, which provides pure and clear vision. Light, however, is not just a property of cosmos, but also of Nous, and by means of light the minds of Man as well as the Mind of God can know all things.